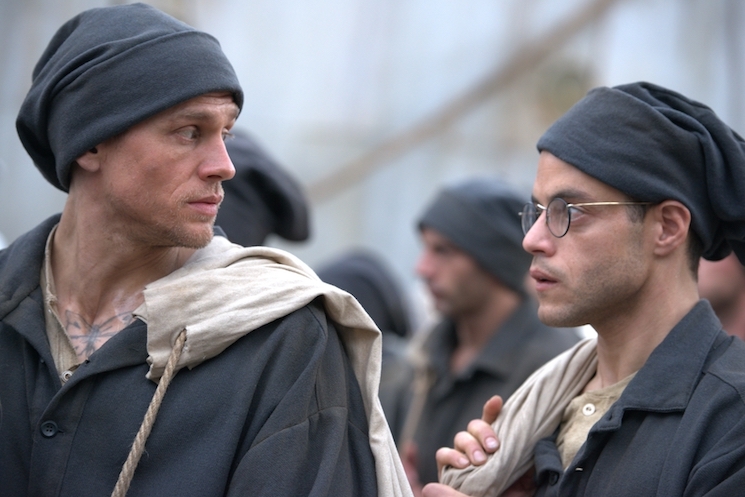 When Henri "Papillon" Charrière (Charlie Hunnam) is sent to a penal colony in French Guiana, the main thing on his mind is getting out of there. He teams up with Louis Dega (Rami Malek), an artistic, wealthy man poorly equipped to survive prison conditions, and offers protection in exchange for finances. A remake of the 1973 film starring Steve McQueen as Papillon and Dustin Hoffman as Dega, and based on a bestselling memoir, Papillon follows the two men through their time at the penal colony and their efforts to escape it. By including some of the same graphically violent scenes of the original, the film dives into the unsustainable horror that is prison life. Sombre grey hues convey the location's lifelessness and in unstable, violent moments, frenetic cinematography creates a sense of chaos. The prison warden makes his intention to "break" Papillon explicit, and through constantly bearing witness to trauma and death, it seems that madness or breakdown is imminent.